Owning animals is very rewarding; they give their owners companionship and unconditional love. Responsibility is a large part of animal ownership; they have to be fed, watered, groomed and you need to keep them from harms way. Owning animals can also be frustrating, especially if you have a puppy. Puppies chew, and generally destroy anything they can fit into their mouths! Have you ever locked a puppy in the bathroom only to open the door to an explosion of toilet paper? Usually the first reaction is anger, and then you have to laugh because he really does look cute sitting in the midst of all that paper. However, he doesn’t look nearly as cute when he has torn up your clothes, one of the couch pillows, or all the cords to the computer. There is one simple solution that will help you keep your sanity, and keep your cute little guy safe. Get a pet gate. Pet gates are basically the same as baby gates. They are adjustable in size so they will fit almost any doorway or opening that goes from room to room. These gates are very versatile, and they can be used for many applications. Restrict your dog or puppy to (or from) an area of the home, separate the dog, (or puppy), and baby when you won’t be able to supervise. 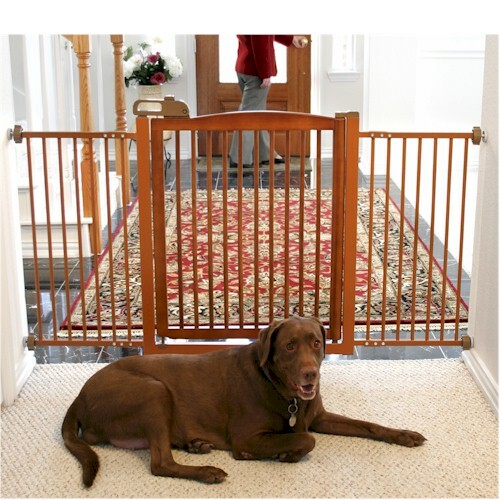 Place a pet gate in front of the screen doors to prevent the dog from scratching the screen. I have a gate in the doorway to the guest bedroom (it is now called the ‘cats room’). My cat gets sick and tired of the dogs barking and trying to play with her. Now she runs down the hall, scales the gate and is safe. As you can see, the pet gate has many uses, and can save you a lot of frustration! The gates are fairly inexpensive, and are worth every penny of the price. Most people find them so useful that they will buy another one or two to use in the home.